The generic name Chelonia was introduced by Brongniart (1800). The specific name mydas was first used by Linnaeus (1758). Popularly believed to have been named for the greenish tinge of its internal fat (coloured by green plant pigments from an herbivorous diet), this species is often called the “soup turtle” and was a staple in the diet of indigenous people as well as European explorers and settlers. In the Caribbean basin it is variously known as the green (or green-back) turtle in English, tortuga verde in Spanish, and tortue verte in French. The average length and weight of adults varies geographically. The typical adult boasts a carapace some 40 inches in length and may weigh as much as 400 lb, making this species the largest of the hard-shelled sea turtles. 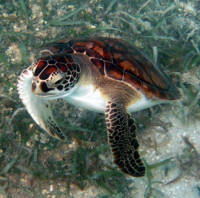 Carapace color ranges from olive brown to nearly black, the scutes are non-overlapping, and the plastron is yellowish. Each flipper contains a single claw. Unlike other sea turtle species, green turtles have only a single pair of prefrontal scales between their eyes. Found worldwide between 30° N and 30° S latitude, with most of the nesting habitat lying within tropical areas. This species nests in more than 80 countries worldwide, and may forage in the coastal waters of more than 140 countries! In Costa Rica, the largest nesting ground in the Wider Caribbean region, nesting occurs primarily between July and September. Most nests are laid in open sandy beach habitat, with the female forming a distinctive ‘body pit’ 2-3 ft in width and depth. Nesting may take two hours or more, resulting in a typical clutch of 110-115 round white eggs. Females deposit multiple clutches of eggs, at roughly two week intervals, during a reproductive season. Females do not breed every year, but return faithfully to their chosen nesting grounds every 2-5 (or more) years. Hatchlings are strongly counter-shaded (black above, white beneath), suggesting a pelagic distribution as young juveniles. Pelagic-stage turtles are carnivorous, consuming small invertebrates, but juveniles return to coastal waters at 8-10 inches in carapace length and live the rest of their lives as herbivores. 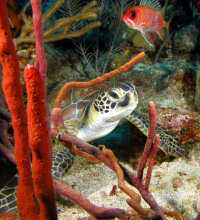 The benthic vegetarian feeding habit of juvenile and adult green turtles is unique among the sea turtles. Growth rate is highly dependant upon ambient temperature, as well as food quality and quantity. The species is solitary by habit, and highly migratory. Management is challenged by a landscape of genetically distinct but geographically overlapping populations. More than other sea turtle species, green turtles face a life-threatening disease in which growths called fibropapillomas occur on their bodies, interfering with their ability to see, feed, swim, and even breathe. 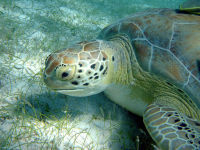 The green turtle is a circumglobal species found in tropical and sub-tropical waters. After leaving their natal beaches, individuals spend several years in the open ocean becoming widely dispersed by ocean currents before returning to coastal waters as young juveniles. 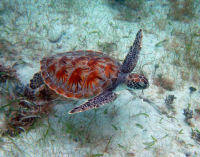 During warm spells, green sea turtles, like many other tropical species, may be found considerably farther north than might otherwise be expected. They have, on rare occasion, been sighted as far north as British Columbia (48.15°N) and Admiralty Island, Alaska (57.16°N). Nesting occurs throughout the Wider Caribbean Region, with Tortuguero Beach in Costa Rica hosting the largest breeding colony. According to Dow et al. 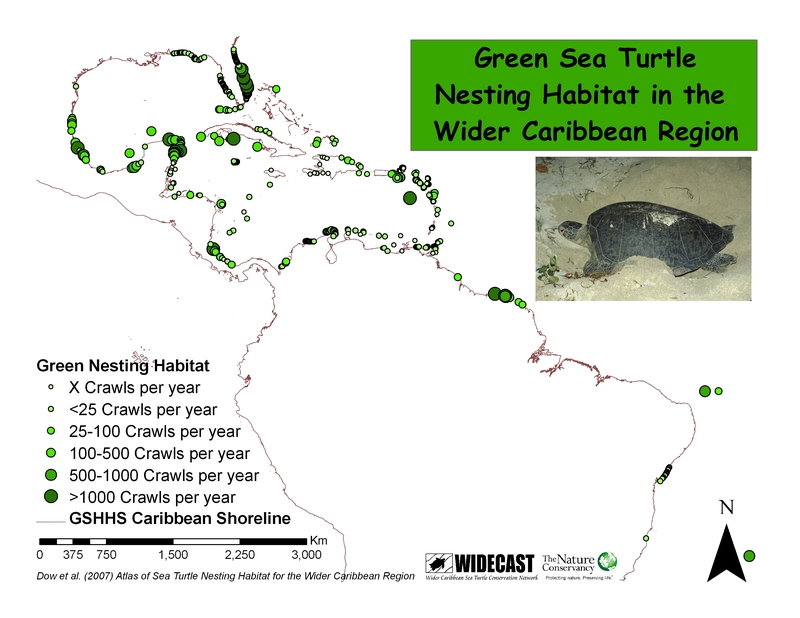 (2007), the 32 beaches reporting more than 500 crawls per year are broadly distributed along the continental margins of Brazil, Costa Rica, French Guiana, Mexico, Suriname, and the USA (Florida); the only insular sites in this category are in Venezuela (Aves Island) and Cuba. More than half (52 of all known nesting beaches support fewer than 25 crawls per year; in 24of sites, data are insufficient to estimate annual crawl abundance. Read “The Sea Turtle: So Excellent a Fishe” (1967) by Archie Carr, published by the University of Texas Press (Austin, Texas); “The Biology of Sea Turtles” Volumes I (1997) and II (2003), published by CRC Press (Boca Raton, Florida); and “Sea Turtles: An Ecological Guide” by D. Gulko and K.L. Eckert, published by Mutual Publishing (Honolulu, Hawai’i) in 2004. Bjorndal, K.A. (Editor). 1982. 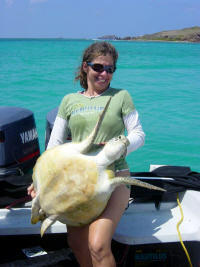 Biology and Conservation of Sea Turtles. Smithsonian Institution Press, Washington, D.C. 583 pp. Carr, A., M.H. Carr and A.B. Meylan. 1978. The ecology and migrations of sea turtles, 7. 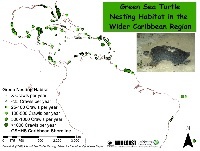 The West Caribbean green turtle colony. Bulletin of the American Museum of Natural History 162(1):1-46. Parsons, J.J. 1962. The Green Turtle and Man. University of Florida Press, Gainesville. 126 pp. Rebel, T.P. 1974. Sea Turtles and the Turtle Industry of the West Indies, Florida, and the Gulf of Mexico, revised edition. University of Miami Press, Coral Gables. 250 pp.